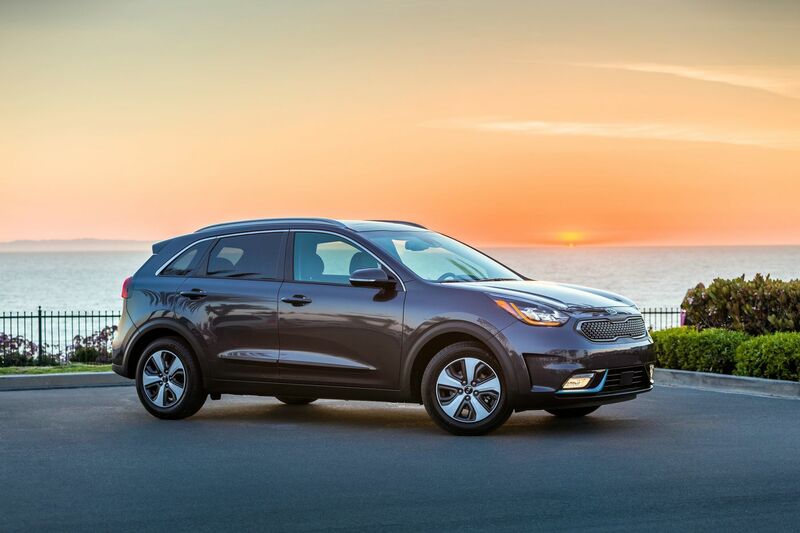 The 2019 Kia Niro PHEV adds a plug-in component to the Kia Niro Hybrid, and the fuel economy goes gangbusters. Conventional wisdom: Edmunds likes its “useful cargo space and utility, a battery that can top up in the time it takes for dinner and a movie,” but said the seats were a downside. What’s new: I first tried the Niro for 2017, and I came away smitten. The little car is like a SemiSoul — a small wagon body style but without the pitiful fuel economy and lacking some of the cooler touches. Fuel economy: And here comes the payoff, nice and early. I averaged 59 mpg in the usual Mr. Driver’s Seat round of testing (in a 2018 model, but it’s virtually identical to the 2019). That’s far higher than the 42 that I saw while driving the 2017 standard hybrid version. I didn’t take any long trips in the Niro, so I was able to plug it in every 50 to 75 miles or so, thus I could make the most of the 26 miles of electric range. Up to speed: And, believe me, I didn’t baby this Niro. I put the 109-horsepower 1.6-liter four-cylinder engine and its 60-horsepower motor mate (totaling 139 hp) to the test. Shifty: Unlike most hybrid systems, the Niro offers an honest-to-goodness six-speed transaxle, so shiftability is available for shift-loving geeks like myself. And Kia does a nice job of offering good feedback from the shift lever. Play some tunes: The Niro as tested received Kia’s Harman Kardon premium audio. Its sound is not bad, maybe a B+, but its functionality is delightful. Knobs control volume and tuning and buttons move users from radio to media to map easily. Sirius XM fans will like the virtually unlimited presets with 10 that are always recording, so finding a good song (and listening to it over and over) is simple. Its 8-inch screen is also ample among smaller cars, as well. The interior of the 2019 Kia Niro PHEV may lack some of the Soulful touches of its stablemate, but it's still attractive and roomy. Inside: The Niro’s seats are just lacking a bit of something-something that the Souls have. The Soul seats seem to cradle while the Niro’s just plop drivers on top and let us slide around. The dashboard is also a lot plainer, as well. It’s worth noting, though, that the Lovely Mrs. Passenger Seat found the Niro to be a nice car, which is high praise from her. Friends and stuff: Rear-seat passengers won’t get all the creature comforts of the front, but they will find a comfortable seat that also provides good leg, foot, and headroom. Rattletrap? I confess I was more than a little annoyed by a rattle from the rear of the Niro. It seemed to be emanating from the rear bumper, although I never confirmed the problem with the fleet company. The noise did get one hit on the internet, so I suspect there’s a technical service bulletin coming sometime. How it’s built: Consumer Reports predicts a 4 out of 5 for reliability of the Niro Hybrid, with no separate info for the Plug-In. In the end: Forget the disappointing fuel economy of the Soul, but forget the affordability, as well. The value of the trade-off depends on your preferences, but I’d lean toward the Niro.